Check boxes allow users to select more than one option from a set of options. Check box provide chase for user to chose from listed option fro example check box for gender, this include male, female or non which the user have the option chosen whether is a female or male. Adding check box to form is very important for any web designer tocreate very interesting form form any user to enter their data, in simple sentence check box is option for user to chose from, it can be multiple chose or single chosen like that of gender check box for other option it can multiple option, is base on what the check box is use for in the webpage. 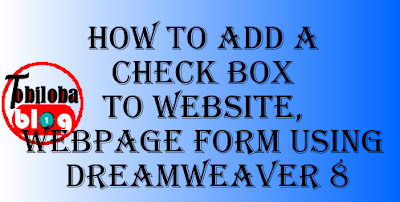 Dreamweaver is very interesting software that make it easy for you to add check box to your website, webpage form during website designing and development. 1. Add any descriptive name for the check box to your page (Ex. Fishing:). 2. Move the cursor to the point where you would like the check box to appear then click on the Insert Checkbox icon in the Forms Objects Panel. 3. Right click inside the check box and select Properties from the menu, if the Property Inspector is not already open. a. Enter a name for the check box. Each check box must have a unique name assigned to it. b. Enter a value for the check box. You may wish to have each check box value as 1 so that you may add the responses later to get a total of responders who checked that box.